This early RAI website had little information and services for passengers but in 2004 RAJA, the passenger company of RAI started its own homepage with more useful content for travelers, a small English section and finally some timetables to download. The website is poorly updated in the English section and therefore of little use for foreign travelers. In 2007 in the Farsi section an online booking system has been added. But due to international sanctions on money transfer to Iran this booking facility is unavailable if you do not have an Iranian ID card as well as a national credit or debit card to go through the reservation process. Furthermore you need to know Farsi for its usage and enter travel dates in Persian (Jalali) calendar. After all, foreign travelers hardly look for railway ticket booking straight forward. They first want to know more about their itinerary and most of all, they need to be informed about the availability of railway connections and what they look like. Providing this kind of information was already the goal of my first website, which had a more railway specific section, too. Now this second kind of information is available in many parts of the web (see LINKS) and so is railway travel information in Farsi. In 2013 I decided to redesign completely the homepage, making it more travel oriented and providing a booking facility for foreigners. I hope you soon share with me the pleasure of traveling by rail all over the marvelous country of Iran, to meet its friendly and kind people. The first website of 1998 was all done in pure html and it was a horrible task to update its pages. This is the reason why after some time I nearly abandoned it. But it is still in the web archive if you like to see it. In 2013 I set up a homebrew CMS in order to update it more easily and more frequently. In December 2015 I could add some features which enable direct connection to the booking systems of Iranian rail passengers companies. Since then it is possible to get realtime availability of all bookable trains for the desired travel date and get tickets within 24 hours. I am not a professional web designer, so please be patient and inform me if something does not work like expected. I will try to fix it. In December 2018 I completely redesigned the website to make it responsive for smartphones. As every device behaves different, design may not always match. If you expect some difficulties in the use of the website, please contact me and send me a screenshot. I hope I can fix it. The code for this website was adapted from several sources, among them a simple bus reservation script for a thesis from Christian Binala from the Philippines (link), an online railway reservation system in php from Rituparna Sonowal from India (link) which unfortunately did not work for me but helped me to implement some features. Thank you all. I would like to thank so much my old friend Markus Schwaiger in Vienna from www.msi.at who has been providing free hosting of the old website for many years. The marvelous picture of the Pardis train in the desert plain near Damghan visible in the background of all pages was done by Mohammad Mohammadi. If not mentioned otherwise, most other pictures have been done by me during different railway journeys through Iran. Feel free to copy them and publish them as long as you mention the author, according to the Creative Common License. Some pictures come from Railway public relation department and Iranian news agencies. Please respect the author''s copyright. This site contains information on railway travel and provides railway tickets. It is maintained on a volunteer basis. All content is provided as much exact as possible but don''t blame us for wrong information or railway schedules. This is not an official railway site, neither a travel agency. The ticket booking request is a forward of RAJA/FADAK/SAFIRRAIL online service with a translation into English and payment facilities for international customers. Tickets bought on this site are issued by Markartravel agency of Iran and transmitted to you by email. We are not a reseller, just a service provider. As such we are responsible for correct delivery and payment routine related to the tickets, but any legal relation concerning the railway trip is between you and the ticket issuing railway agency or company. The use of this website is free. No personal data will be collected and stored from the website visitor in a hidden form and without placing any order. The main purpose for which iranrail collects your personal data on order forms is to provide the services of iranrail. Personal data is collected and processed for this purpose in compliance with legal requirements related to issuing tickets and providing services requested by the customer. For this purpose, the following personal data may be collected and processed: customers name, surname, gender, age, data from an identity document, citizenship, email address, phone number, city, receipts related to the payment of ordered services. The following data may be transmitted to third parties in order to provide the services requested by the customer i.e. issuance of tickets: names and surnames, gender, age, data from an identity document, payment receipts. With regards to the privacy protection laws in EU, by transmitting your personal data to iranrail in case of ordering a service, be informed that we cannot guarantee for the privacy of the data which will be handed over to our commercial partners outside EU. We therefore limit the data transmission to those data which are strictly necessary to the delivery of the ordered service as stated above. If you do not agree about this, please do not order any service with us. The following data will NOT be transmitted to third parties: citizenship, city, email address, phone number. These data are collected by iranrail for the sole purpose to facilitate communication with the customer and to build up internal statistics. In no case these data will be used to build up and/or memorize individual customer profiles. 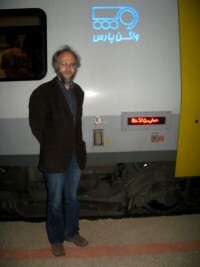 They may, however, be used for compiling anonymized statistics about the usage of services on iranrail.net. These anonymized statistics may also be shared with the commercial partners of iranrail.net. All data collected internally by iranrail will be canceled periodically if they are not needed any more for the above mentioned purposes. The customer may ask cancellation of the collected data as soon as the ordered service has been paid and provided i.e. in case of tickets - after the end of the trip. These cancellations will not affect the data transmitted to third parties i.e. service providers in relation to the delivered services (sold tickets). The privacy terms of this website are governed by Icelandic law. Disputes arising from these terms shall be brought before the Reykjavik District Court. Billing of tickets is done by Lake Bracciano Tourist Association which is legally registered in Italy with VAT Number 07751691002. Terms and Conditions for ticket sales.